The drawback (though the book should be read) to the book is his attack on premillennialism in chapter eight. After arguing for the Puritan tradition in America being the Christian standard, he proceeds with eight chapters all beginning with the phrase, ‘‘The (first) influence that helped to undermine what was left of the Puritan mind and leave its mark on Evangelicalism is . . . 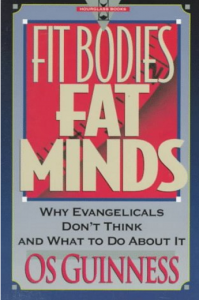 The eighth chapter is ‘‘premillennialism’’ saying ’’ it comes out with a red-meat rhetoric of alarm that is as wildly successful as it is wrong-headed and irresponsible.’’ Well. One apologetic against the worldliness within Christianity today is from the Calvinistic or Reformed tradition such as Guinness, Michael Horton and Robert Wenz. I have appreciated their willingness to the task. For the life of me, however, I don’t remember Christianity beginning with Calvin and the Puritans. Thank God for their place in history but that is just what it is. To make premillennialism and anything less than supralapsarianism the cause for all of Christianity’s woes is a strenuous gnat. Other than that, I liked the book!